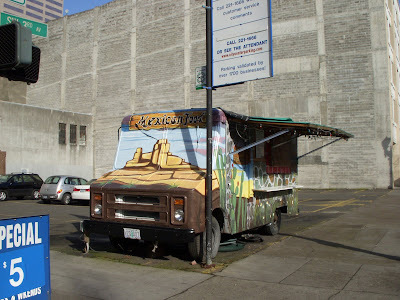 One sign that Portland is attitudinally different from Cincinnati, is the presence of dozens of Food Trucks on parking lots throughout the city center. Would the people of Cincinnati ever allow such disorder to occur? I doubt it. The Building Department would have fits. I loved it. We need some of these guys to set-up at Fifth and Race. 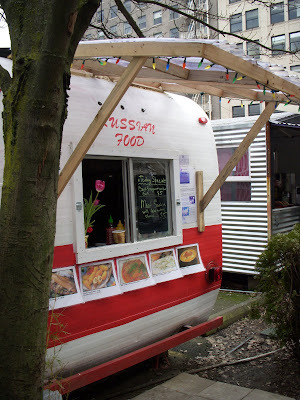 UPDATE: There is a new blog devoted to Portland "Food Carts". Not in the city center perhaps, but I can think of two right off the bat. One in Walnut Hills and another in Oakley. Contact me offline for directions...don't want to arouse the forces of evil. A third is in an old house near my office in Lincoln Heights. Common features of this type of establishment seem to be zero budget for "atmosphere", somewhat subversive attitude among the close-knit community of patrons, an owner who can only be described as a "character", and totally awesome food! I'm intrigued that Portland has found a way to bring them closer to the mainstream without killing the concept. I'd love to read more about them when you have time to blog about it. I'm trying to find out the legalities of such an operation. I know in Ohio, the Health Department will only give permission for such operations for a few weeks at a time for such things as festivals, and even then you are limited on the type of food allowed to be sold. I do kinda wonder about sanitary conditions with no toilets or handwashing available. In NYC, where I grew up, there are of course, many, many food carts. When I was a child they were all hot dog and pretzel carts (and roasted chesnuts in winter)but now there are lots of kinds of different ethnic foods too. Clearly, the Health Department has found a way to deal with the sanitary issues. The carts all have certificates prominently displayed (they look sort of like those elevator inspection certificates) -- I guess they show that the carts are legit -- never stopped to read the fine print! NYC also has lots of street stands selling things like umbrellas and hats. Historically, there's always been tension between shop owners and stand/cart owners -- the shop owners don't like competition on their doorsteps (plus, competition with much lower overhead, i.e., no rent). In some eras, the push carts have prevailed, in others, the shop owners. 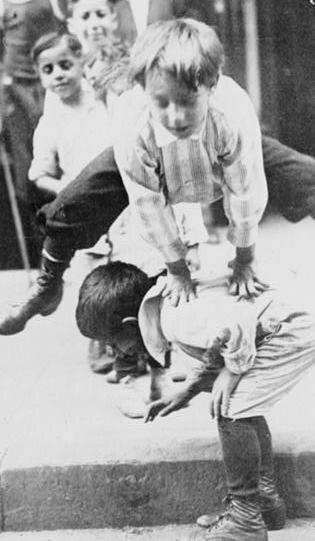 (I saw a very interesting exhibit on this in the Tenament Museum about 18 years ago). And finally, lots of street performers in NYC, some of them very, very good. NYC is great. I had an outstanding chicken kebob sandwich at 3am from a street vendor who worked from midnight until morning. As mark miller commented, we've got some around here, but they can blend into the background. One I really liked was Humble Bee's on Ravine St. It's gone, though. Ollie's Trolley would count, wouldn't it? ^I think Ollies Trolley is actually a fixed building with plumbing etc.. but I'm not certain. I zoomed in on your photo of the mexican food truck and discovered a few things I hadn't noticed before. That little grey box on the corner of the passenger side front bumber is a 30 amp disconnect fed from an underground electrical service. There's liqui-tight conduit running along the ground to the vehicle. Underneath, between the wheels, appear to be two large coils of hose for plumbing. Perhaps one is domestic water, and the other sanitary waste. The vehicle looks road-worthy, but not road-ready, judging by the painted-over windshield. I'm guessing they set these food-campers up, plug them into public utilities and leave them there for months or longer. Most campers come ready-made for bottled gas cooking and heating, sparse electric, and have mini-toilets and wash sinks. That would appear to solve the sanitary conditions puzzle. Good observations Mark. There obviously must be coordination and even support from the city to make this possible. Street food? It's what's for lunch! 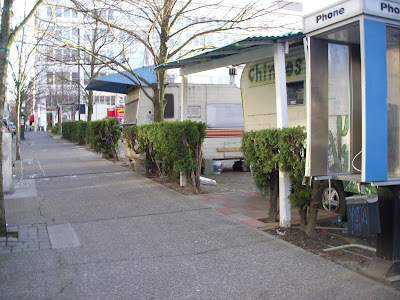 (In fact I'm eating some right now from the Thai cart near the gyro cart in your photo). There is support from the city, permits, inspections, etc. There is some tension from between the carts and restaurants, but honestly, if there was ever a crack down on the food carts, downtown office workers would take to the streets. 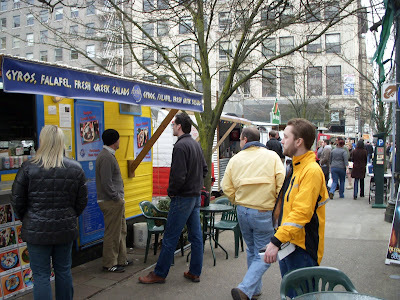 One of our free weeklies, the Willamette Week, even rates the food carts. They're a downtown institution. Street vendors usually don't pay a lease/rent and therefore proerty tax that take care the sidewalks. trash etc.. that businesses create. They do usually pay fee's like other business's. Portland mostly has designated area's where these stands are and the market downtown is a couple of blocks of these( Farmer/artist market??). Portland is nice but a few things to remember when comparing to Cincy. They are growing and Cincy is shrinking. They have better weather, usually in the 50's and 60's in the winter and snow or weather below freezing is rare. their openness has caused many nasty problems. The parks are constantly full of heroin addicts and runaways that make these pretty parks pretty nasty. Portlands downtown is hard up against hills that devide it from most residential neighboors and those hills have a big park that also separate Dtown from most neighborhoods. Portland is on both sides of thier river so one city controls the metro area and they are the only city of any size between seattle, boise Id, and Sacramento Ca. Just some thoughts. ^Good comments. I agree there are many differences. Portland is growing, but is Cincinnati shinking? I'm not so sure. The region continues to grow, that is certain. The weather is more mild in Portland, true, but it is not perfect. Having Kentucky across the river definitely adds to the difficulty of organizing a regional solutions to problems.